Population health management requires a rigorous analysis of both cost and quality. The Centers for Medicare and Medicaid Services (CMS) and commercial payers have taken the unprecedented step of providing claims data to their participating Accountable Care Organizations (ACOs), but they are unable to provide even the most basic clinical quality measure data in parallel with the claims reports. This is due to the fact that quality data is embedded in the clinical documentation of the electronic health records (EHRs) within the ACO physician practices. It is the work of the ACO to collect and analyze clinical data about the process of care delivery and patient outcomes across the attributed population. In order for ACOs to be successful they must develop a strategy that clearly defines the structure, function and goals of their data collection and analytics efforts. Healthcare payers and policymakers are currently emphasizing the importance of preventive care services to achieve lower cost and higher quality of care. Evidence has also shown that when patients receive adequate preventive services they tend to experience fewer chronic condition complications and adverse outcomes. Until recently, incentives to engage healthcare providers and patients in preventive services have been insufficient to encourage widespread implementation. CMS’s reimbursement for preventive services was a significant step toward establishing preventive care for its beneficiaries. The subsequent preventive care service requirements of the Affordable Care Act expanded the same type of coverage to most Americans who have not reached Medicare age. The combination of these two patient populations has provided significant incentives for healthcare providers to change their clinical practices to accommodate preventive services, but also for financial growth of the practice. Americans receive only 55 percent of recommended preventive services, and this gap is costing U.S. lives and increasing healthcare costs. For these reasons, care gaps are a major component of the ACO Clinical Quality Measure (CQM) reporting for process-based measures. Filling gaps in care provides a tremendous opportunity to advance clinical and administrative workflows through better patient care while improving outcomes. Managing gaps in care is a two-sided equation. Traditionally, this has involved identifying care gaps reactively. However, health care reform is promoting efforts to leverage clinical data analytics to proactively identify and outreach to patients before gaps occur. Care Coordination is one of the four ACO domains of quality measures that govern the Medicare Shared Savings Program (MSSP). Therefore, it is imperative for all ACOs to balance both sides of the equation with workflows that ensure that providers and patients adhere to the evidence based standards that define effective healthcare. By building and utilizing a well-defined quality performance program that includes the effective management of gaps in care, ACOs will be able to meet both the quality standards of today and those that will be introduced in the future. The Chronic Care Management (CCM) service code is a new CMS preventive care initiative that can help practices close care gaps while earning additional revenue. Many commercial insurance payers have also agreed to reimburse for the service, which makes it the largest expansion of oversight service incentives in recent history. Approximately 68 percent of all Medicare patients will be eligible for the CCM service, which means the average practice could collect more than $100,000 in additional annual revenue per physician. In short, the new CCM code allows for the billing of no less than $40 per month per patient for 20 minutes or more of chronic care management services. Medicare patients with two or more chronic conditions are eligible for these services, and patients have the ability to opt-in or opt-out at any time. Only one provider per patient may bill for these services. A key component of the CCM service is the ability to track and report on eligible patients and corresponding CCM activities. A wide range of activities are applicable, such as care coordination or verification of information from other providers. Knowing when a patient has received care from the CCM provider will be necessary to successfully track and bill for the service. The intent of the reimbursement is to compensate clinical practices that have traditionally provided such services with no realized revenue. As physician practices and health systems work to improve quality and decrease costs, such initiatives require financial, workflow and information technology (IT) resources to accomplish the tasks. Fee-for-service opportunities afforded by filling gaps in care, completing Medicare Annual Wellness Visits, and providing the new Chronic Care Management services offer revenue-generating resources to pay for these initiatives, thereby incentivizing practices while simultaneously improving the quality of care. Collectively, these fee-for-service opportunities represent more than $250,000 in annual revenue per physician in primary care. Physician engagement that includes a working model of interaction between the physician, the clinical staff and their patients is the most adaptable methodology with a clear path to value. The Patient Centered Medical Home (PCMH) model provides clear guidelines for improving engagement. It supports a physician-led, team-based approach to care that focuses on whole-person orientation, care coordination and patient communication. Each medical practice is capable of defining their own model by adopting components of PCMH that are useful and customizing other components to fit their unique circumstances. Patient engagement models allow clinical practices to move from reactive to proactive processes that facilitate a focus on preventive services. Using clinical data to track clinical processes, but also the patient’s response to engagement is a key objective. Again, PCMH-like models offer opportunities to build clinical processes that coexist easily with current CQM programs. This symbiotic relationship offers outcome improvements as well as financial incentives for those clinical practices that successfully implement information-driven processes. Another byproduct of the PCMH model is improved efficiency regarding the utilization of healthcare provider resources. Specifically, off-loading work that is not “top of license” for physicians is one of many objectives that can be built into clinical process models, resulting in improved provision of the appropriate care by the appropriate provider. In order to build the future for value based care, it is critical for ACOs to learn about the sources and types of data that payers provide and understand the strengths and weaknesses of these reports. We focus below on CMS reports as they are quickly becoming the “gold standard” for all payers in their ACO programs. CMS provides an immense amount of information, but it is important to note that this information is retrospective, in aggregate, and lacks granular patient-to-provider attribution. However, the reports that CMS provides are useful for analysis including, but not limited to: cost trending by claim type, identification of patients with a history of high-resource utilization, and cost of ambulatory care-sensitive discharge rates. 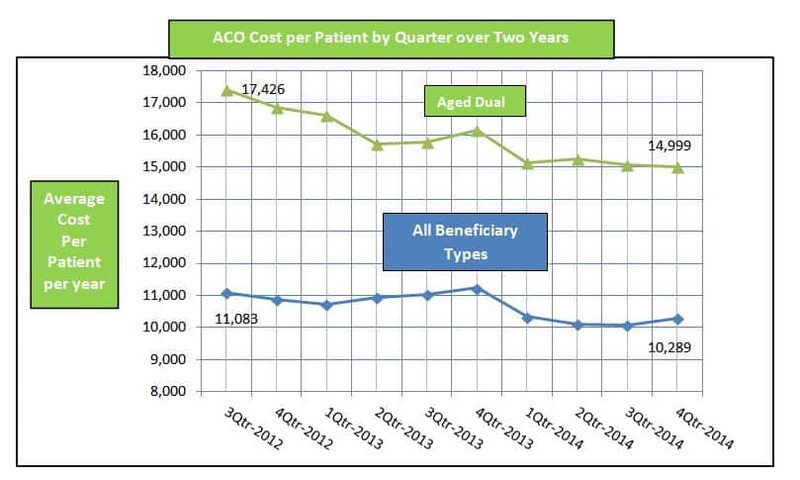 The first reports that most ACOs receive regarding the quality and cost performance of their beneficiary populations are the Quarterly Aggregate Report (QAR). The QAR are broken down into 3 categories: the Quarterly Beneficiary Assignment Summary Report (QASR), the Quarterly Beneficiary Assignment List Report (QASSGN) and the Aggregate Expenditure/Utilization Report (QEXPU). These are delivered in spreadsheet format that defines all assigned beneficiaries as an aggregate population and as individuals assigned to the ACO. The QEXPU also provides aggregate summary information for cost and utilization of assigned beneficiaries. Together, these reports should be used to track the ACO’s trending of beneficiary assignments, cost and utilization. Over the term of the ACO’s contract, this information can be crucial in determining the effectiveness of programs that are intended to increase ACO participation (QASR and QASSGN) or decrease cost and utilization (QEXPU). CMS Claims and Claim Line Feed (CCLF) reports also play an important role because cost and utilization can be analyzed to identify high-cost/high-utilization beneficiaries and providers. CCLF data is provided by CMS after assigned beneficiaries have completed an informed consent process. However, not all beneficiaries will choose to participate, which means that CCLF information cannot be completely reconcilable against other sources, such as the CMS Quarterly Aggregate Reports. Proposed rule changes will eliminate the informed consent process. If adopted, this would start in 2016. In terms of ACO product selection with a clear path to value, at a minimum, all ACOs require a method for collecting CQM data and reporting annually to CMS. An information system that is capable of extracting and consuming EHR data to pre-populate reporting registries improves the accuracy of reporting and decreases the burden of manual entry of reporting data. It is important to note that the randomly selected sample population constitutes less than one-third of the entire attributed ACO patient population. Therefore, the collected information serves only to fulfill CMS compliance reporting, but does not meet the greater need to track and analyze the quality performance of the ACO’s entire beneficiary population to improve overall care delivery. It is this greater need that compels ACOs to implement information systems to extract clinical data from the multiple EHRs of the ACO in order to create patient registries that include real-time process and outcome measurements. These registries are useful for multiple strategies: real-time status tracking of the ACO clinical quality measures as required to meet the minimum scores required by shared savings models, use of the registries to close gaps in care, and the combination of clinical and claims data for accurate and actionable risk scoring of the patient population. New insights into provider behavior patterns including referral patterns, utilization comparisons, and overall performance of process and outcome measures are just a few of the many resources that can aid an ACO in its work to understand both its beneficiaries and their providers. One of the most desired goals in healthcare today is how to predict patient utilization patterns. However, predictive models are not part of today’s mainstream health information technology. Predictive methodologies are being introduced into population health management systems, but the inclusion of these processes in clinical practice is still distant. In assessing predictive models it is important to consider first the underlying data utilized. Historically, claims data has been analyzed to predict future utilization. The combination of claims and clinical data provides a new and more accurate foundation to predict future utilization, and to effectively intervene with patients across multiple risk levels to improve health and decrease costs. The four-step ACO performance model includes: leverage fee-for-service to fill gaps in care, improve quality scoring, and increase revenue; implement care delivery models to support value; maximize use of claims reports; implement information systems to support the combination of claims and clinical data. This model proposes that extracting clinical data, creating patient registries to identify gaps in care, and incentivizing practices to fill gaps in care will increase practice resources while simultaneously improving the quality of care. The greatest value of claims and clinical data is not in standalone products; but rather is within the strategic combination of this data to improve the quality of care with a long term focus on decreasing costs in a value based care environment.